Every moment of leisure implies a celebration of freedom. The ability to relax, enjoy time with friends and family, travel, watch birds, or indulge in any expression of recreation derives from liberty from oppression few of us really understand. So whether you’ve been celebrating your nation’s birthday or the freedom to chase your own bliss, live that independence up! My holiday weekend festivities included pointing out common yet charismatic Cedar Waxwings all weekend to friends in Cuba, NY; everyone loves those little charmers. Corey once again had an embarrassment of avian riches to choose from this weekend, from a Ruff at Jamaica Bay on Friday morning to a Red-shouldered Hawk over his parents’ house on Sunday. 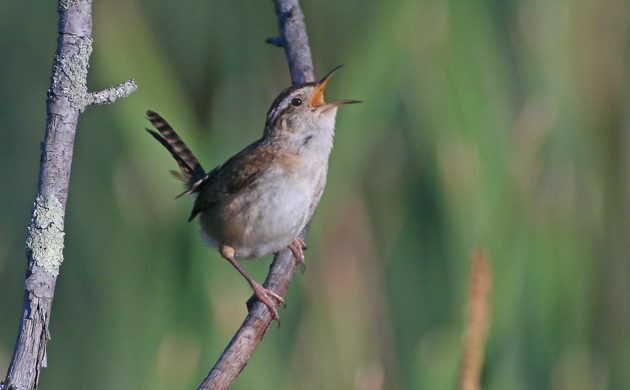 But his favorite bird was at one of his favorite birding spots, a Marsh Wren singing exuberantly at the Great Vly in Saugerties. There’s something about that loud, liquid song coming from such a small, bland bird that made it Corey’s Best Bird of the Weekend. Saturday I made my 4th Annual July Fourth Trip to fabled Goose Pond in South-Central Indiana. The water level was lower than years past so the habitat wasn’t as conducive to certain species. I did see the expected Least Terns and Black-necked Stilts and heard Marsh Wrens. But for the first time missed the Common Gallinules and Least Bitterns. Pied Oystercatcher breeding season starts early! ABA Birds of New York Giveaway Results! Where Are You Birding This First Weekend of August 2009?